Our final set is Happy Mail and it has a coordinating die as well. I created a window card by die cutting a window in both the panel and the card front using the Garden Window Die Set. Then I stamped the image onto some White card stock and colored it with Copics. I used the coordinating Dies to cut it out. I die cut a second image as well with no stamping, I put just the outline of the image on the backside of the colored image after I adhered some foam tape. This covered up the tape so you couldn't see it from the other side when the card is opened. The image is adhered to panel on the edges of the grass and the mailbox. On the inside of the card I created a scene with some stencils and Distress inks. I felt it needed a little something extra so I stamped the sentiment in the upper portion of the inside so it would show from the window and I hide a little bird along the bottom. The bird is from the Raccoon Rascals set. I just trimmed him out with my scissors. Super cute!!! Would you like to win the “Happy Mail” Stamp Set? 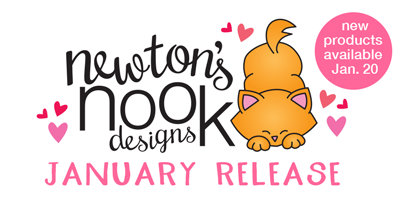 Be sure to stop by the Newton's Nook Store tomorrow to pick up your favorites from the Release!!! this is my favorite stamp! Such great stripes and I love your coloring of this fun new set! This is so great! Love this set! Holly, this is so cute, love your color scheme and a pink mailbox!! I love how you used this stamp set to create a scene both on the front of the card, and then by cutting out that panel created the "inside" scene as well. It really looks beautiful and gave me some great ideas for using this already adorable set. I love to send happy mail, so this is a must have set! Awww!!! Adorable mailbox card!!! Too sweet and cute!!! Great card. Love the stripe "postal" border. Love your card, such a great idea with the frame and the scene behind it! This new set is my favourite, love, love it! Newton is always adorable, and this set is very useful! in the mailbox is darling. This is adorable! 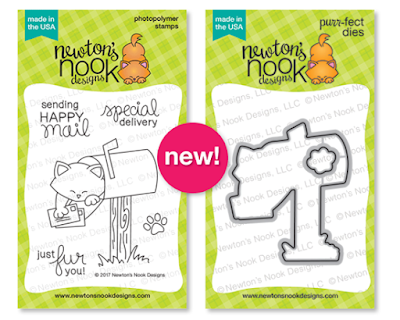 Newton in the mailbox is so darling! Very pretty card too! Your card is adorable and this is the best mailbox stamp set ever. I love how you placed Newton over the window like that! Looks great! Cute delivery postman themed card. Hehe. Wish I had this one, would be perfect for the post delivery men/women in our countries. Love the pink and red striped variation on the traditional "postal stripe" colors. This is so adorable!! What a clever window design. Live the layout of your card design! OH how fun and cute! Very cute window card--love the pink mailbox. this is so cute!!! Love how your colors work with the stripped paper!! I love how you colored this in "Valentine" colors! What a cute idea for a cute new set! I love the soft colors on your card! Your smooth coloring on Newton makes him look so soft! What a cute card design! Love your coloring! Very sweet...love the window design. Beautiful coloring! Love that striped background too! This is such a cute set. I love it! What a fun card! I love how you made a frame on the front and the scene on the inner portion. Such a great way to add dimension and depth to your card. Way too cute! Love the window! Pink mailbox - really cute! This is so cute--I love the colors! Oh my, pink, pink, pink, my favorite color. Love the wonderful coloring and how you did the cloud background and the little bluebird chirping at the kitty. Adore this darling pinky card! Amazing colors and design! Beautiful card! Love the scene and the colors of your card.